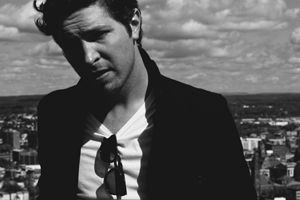 I am thrilled to welcome special guest singer/songwriter, Matt Wertz from Nashville, Tennessee. While he may not realize it, his music has been very influential in my novel writing. Feel like there’s a bit of a disconnect between writing a novel and writing music? I beg to differ. First, there’s the lyrics which represent a kind of story the musician wants to tell. Then, the melody—which us writers may liken to the theme of our work. Add in back-up singers, percussion, and other instruments—we’ll call them the supporting characters. Finally, there’s the tedious work of orchestrating everything so it’s presented in a neat little package…a song, a book. Now, let’s hear it from Matt! Leslie Lindsay: In watching some of your YouTube videos (‘Matt Wertz Live at Home’ are some of my favorites), I adore the friendly banter between you and your band mates. Can you tell us who these guys are and how y’all became a band? Leslie Lindsay: When writing, what comes first for you—the lyrics or the melody? Leslie Lindsay: So many of your songs truly tell a story. How is it that you are able to condense what may have been a big experience in your life to a three-and-a-half minute song? Specifically, I am thinking of 5:19 and Nobody’s You. Actually, can you also tell us the backstory of Nobody’s You? Leslie Lindsay: In novel writing, we have these terms we apply to ourselves…’plotter’ or ‘pantser.’ A ‘plotter’ is basically a person who needs every detail worked out in his or her mind before taking pen to paper. A ‘pantser’ is a fly-by-the-seat–of-their-pants writer; it happens on the fly, when they’re particularly struck with something. How would you define your style when it comes to songwriting? Matt Wertz: “In the beginning, I was definitely a ‘pantser’ and I would say that my default nature is definitely that. However, when the inspiration isn’t necessarily flowing, we ‘pantser’s’ still have to write! So I have had seasons of being in the discipline of writing every day. At least making a ‘go’ at it. A friend of mine likes to say ‘Writers Write’- and I think that, especially with songwriters we can get spoiled on having songs fall in our laps that we don’t ever learn how to work. That was the case for me early on and I’ve really had to learn what it looks like to ‘work’ at songwriting. Leslie Lindsay: And, can you share a bit of your creative process/inspiration? Matt Wertz: “Well, What that looks like for me is sitting down, turning off my cell phone, turning off my computer (or at least shutting off the internet), and just diving in. Playing guitar- see if whatever I’m playing inspires a melody, and if [there] are any syllables or sounds that feel ‘hooky’ or integral. At that point, the song title or chorus lyric might come to me; often times, that’s where I try to start from- the Title of the song. What is it about? Why am I writing? Do I have anything to say? That might also come from my journal of ideas I keep. Ideally, I try and bar the critic from the room for the initial moments of inspiration- if you get too self-critical too early in the process, you’ll find yourself quitting before you ever start. I typically also try to get the song to a place where I feel like it’s reached a tipping point of ‘this is working’ or ‘this is cool’ and then get away from it and do something mindless to let my subconscious mind play with the lyric. If I’m focusing on something super hard, I don’t think my subconscious gets room to throw it’s 2 cents in, and that’s where the best stuff comes from, in my opinion. I have this ring game on my front porch (its in one of those ‘live from home’ videos) that is a nice, mindless distraction that frees up my subconscious. Leslie Lindsay: As artists—whether visual artists, writers, or musicians—we seek to convey emotional expression to others. What do you hope people take away from your music? Matt Wertz: “I hope that people who listen to my music connect with it. That can happen in several ways- they could just enjoy it from a very surface-level ‘hey, I like the beat’ or it could be that the lyric really hits them, or a combination of the two. Ideally, I would like to offer hope to people as they listen and discover they aren’t alone. The best thing is when I hear a song that puts to words emotions I’ve never been able to communicate. I hope I’m able to do that for others too! Thank you, Matt for being with us today. Just fantastic to get to know you and your writing process! Stay tuned for tomorrow, when Matt will answer one final question regarding his newest album, HEATWAVE (available August 27th 2013) and a glimpse into the song that inspired a chapter in my novel-in-progress.